Is there a “screw sense” glyph available in some LaTeX package? (compare §II.8 of Schouten: Tensor Analysis for Physicists, Dover 2nd ed., 1989). I've searched the Comprehensive LaTeX Symbol List for "screw", "right-hand", "gyr", and similar, but found nothing. and a similar \laevo as surrogates. A just-do-it-yourself solution with the hobby TikZlibrary. If you prefer a rounded tail you can add \filldraw[black] (.1,.85) circle (1.8pt); to the definition of \mydx, as JuoleV pointed out, or use an appropriate node like in \jdx. For creating the gap, you can use the option [blank=soft], like in \gapdx. Is there a “contradiction” symbol in some font, somewhere? Wrote a new package. Is there some standard place to share? Are there hexagon brackets in LaTeX? 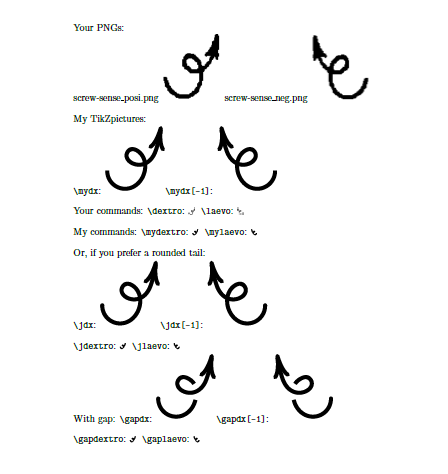 Is there a trident symbol in LaTeX? Is This Laplace Transform Symbol Available in LaTeX? Is there a latex symbol for glasses?